Model T Ford Forum: 1903? Model T Ford Forum: Forum 2011: 1903? My neighbor found this in somes things he bought at an auction. At the bottom says it was the first Ford advertised in "The Saturday Evening Post". Is it a 1903? Yes, with the optional rear tonneau. 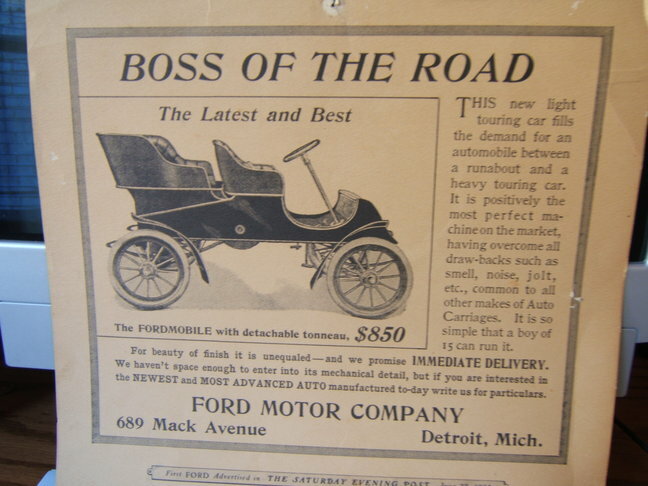 I like that the moniker "BOSS" was used by ford as far back as 1903. From the online encyclopedia. The ad appeared before the first reported sale. "...the most perfect machine on the market, having overcome all draw backs such as smell, noise, jolt, etc. common to all other makes of Auto Carriages." I notice the name Fordmobile under the picture - that name didn't catch on as it did with Olds..